You can make slurry for watering. You make it like tea: you let the useful and necessary materials be pulled out there for direct use, by pouring over (hot) water and to stir regularly. This process may take several days. If you don’t have muck you can also make liquid plant food. 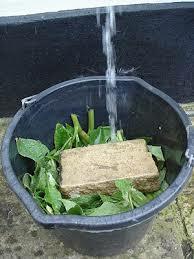 A useful recipe for all plants based fertilizers: put 1 kilo leaf under (10 liters) of water. Put stones to keep the greenery underwater. There may some sugar be added. That gives a better digestion, and more tack. Stir every day. After one week (or 2) dilute it 3 to 5 times before use. Horsetail liquid contains a lot of silica, strengthens plants and gives them resistance to fungi. Prop a tube with bottom filter, or a perforated bucket full of comfrey leaves. Put some heavy stones on and close it. After a few weeks there is a black liquid dripping out. Which can dilute before use at 1 to 10 (to 20). Comfrey contains as percentage of dry matter 5.8% potassium, 3.5% nitrogen, 0.5% phosphorus and proteins. Which is 2-3 times more potassium than in dung. Root hormones can be extracted from (curl) willow by soaking branches and young bark in water. It promotes root growth of plants and cuttings.